The Bible mentions the Nephilim in Genesis 6:4 and Numbers 13:33. There are different theories and ideas about who, or what, the Nephilim were. According to the Bible the Nephilim are the offspring of sexual relations of the “sons of God” with the “daughters of men,” or angels and humans. It is my understanding that some Orthodox Jews believe the Nephilim were the descendants of human nobility. Also there are the theories concerning the Nephilim and giants and even possible connections to extraterrestrials. Extraterrestrial Contact Described in the Bible? Do certain things described in the Bible appear to be extraterrestrial contact? 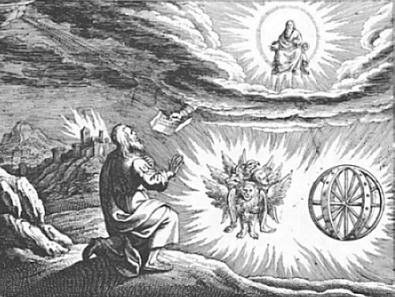 The strange wheels within wheels that are described in the book of Ezekiel are often cited as evidence that the Bible has recorded extraterrestrials interacting with human beings. There are other craft and events described in the Bible that are reminiscent of UFOs or extraterrestrials. Do you believe these passages were in fact descriptions of extraterrestrial technology and interaction? “… 9And when I looked, behold the four wheels by the cherubims, one wheel by one cherub, and another wheel by another cherub: and the appearance of the wheels was as the colour of a beryl stone. 10And as for their appearances, they four had one likeness, as if a wheel had been in the midst of a wheel. 11When they went, they went upon their four sides; they turned not as they went, but to the place whither the head looked they followed it; they turned not as they went. If you would like to read the full passage go to Biblegateway.com or look it up in any Bible you choose. Green X’s Connected to UFO Sighting? Did Aliens Crash in Roswell in 1947? Do Aliens Put Implants Into Humans?